BWR Aluminum Radiator - Dezod Motorsports Inc - Home of the automotive performance enthusiast since 2002. If your in the market for a high flowing, high performance radiator BlackWorks Racing is your best bet. Do not be fooled by other imitation companies. BlackWorks Racing stands behind our products with a life time warranty against manufacture defects. BlackWorks Racing is a great upgrade for your street car, weekend warrior, or full on track car. With our dual core design, cooling your vehicle is not a problem. The BlackWorks Racing radiators will keep your engine cool even under the most extreme high heat racing conditions, or driving in the high heat hellish temperatures in the desert of Arizona. So rest assured, your investment with a BlackWorks Racing radiator will not only be the best purchase but will be the last. 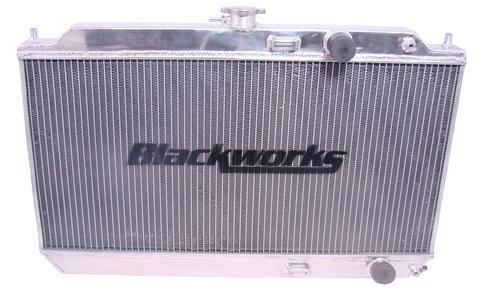 BlackWorks Racing Radiators are a direct replacement with being able to use all stock fans and hoses if desired.